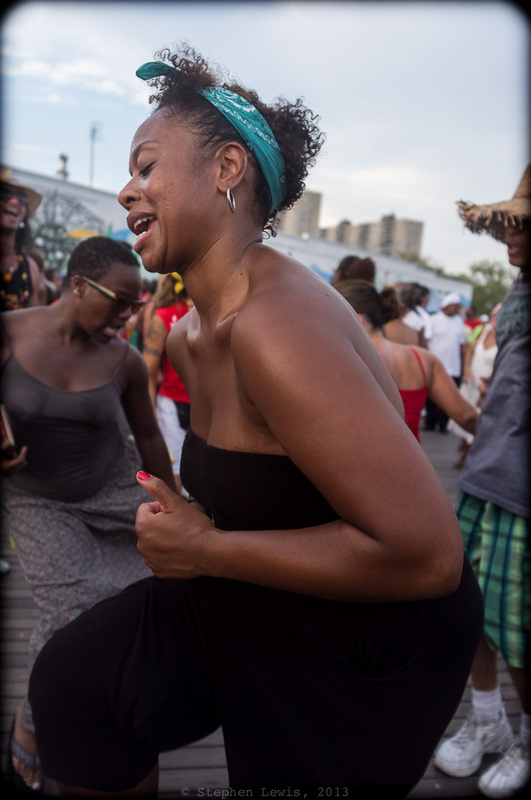 Weekend afternoon dance party, Coney Island Boardwalk, Brooklyn, New York, 2012. (Fuji X100 w/ 28mm-equivalent lens adapter). Click to enlarge. I haven’t gotten out to Coney Island this summer. So, offhand, I don’t know the state of the famed Coney Island-Brighton Beach seaside boardwalk post-Hurricane Sandy. What I do know is that I very much miss dancing on Coney Island boardwalk in the breeze and fading light of weekend summer afternoons. 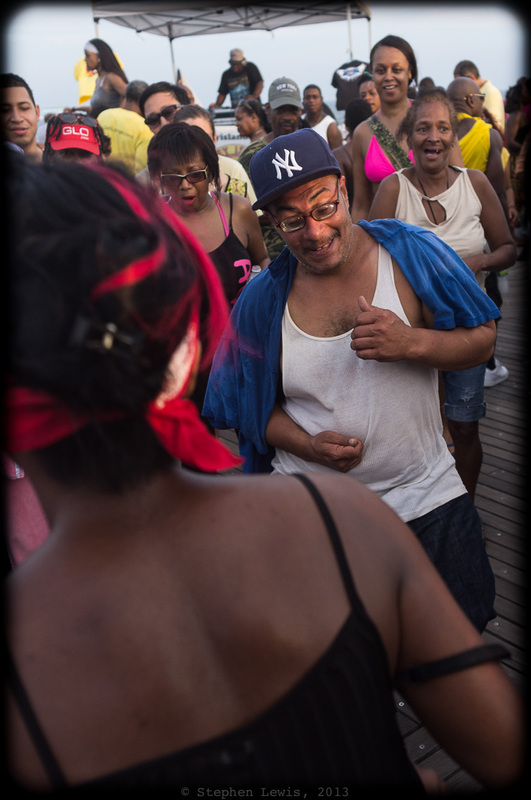 Most Coney Island boardwalk dancers are urban survivors, people who’ve made it through the scourges of low-paying jobs or lives at the edge. The music is mostly Afro-Caribbean, Latin, and fusion. The price of a ticket is no more than a lack of pretension and a desire and ability to dance. These last years, I’d gravitated more and more towards to weekend dances on the boardwalk. The grit of the edge of the city is more redolent of the New York that shaped me, and the boardwalk venue is far more familiar, accessible, and welcoming to me than are stylish clubs in upper income Manhattan or in the ethnically-purged, middle-American “hipster” neighborhoods that now sprawl across the north of Brooklyn. Not least, the subtle flexibility and responsiveness of the boardwalk’s wood plank surface add spring and an intoxicating feeling of (seeming) virtuosity to one’s every step. More Coney Island dancers. (Specifications as per photo above) Click to enlarge. On the X100, the optical imperfections (softness, flare, and color casts) of Fuji’s 28mm-equivalent screw-in wide angle adaptor helped rather than hinder portrayal of a Coney Island weekend afternoon.